The market continued to see relentless selling pressure between October 1 and 5, with the Nifty falling 5.6 percent to close a tad above 10,300 levels. The surprise move on rates by Reserve Bank of India’s (RBI’s) Monetary Policy Committee (MPC), the consistent fall in the rupee and crude volatility attributed to the selling pressure. The Nifty 50 closed at a six-month low on October 5, making a large bearish candle on the daily as well as weekly charts. 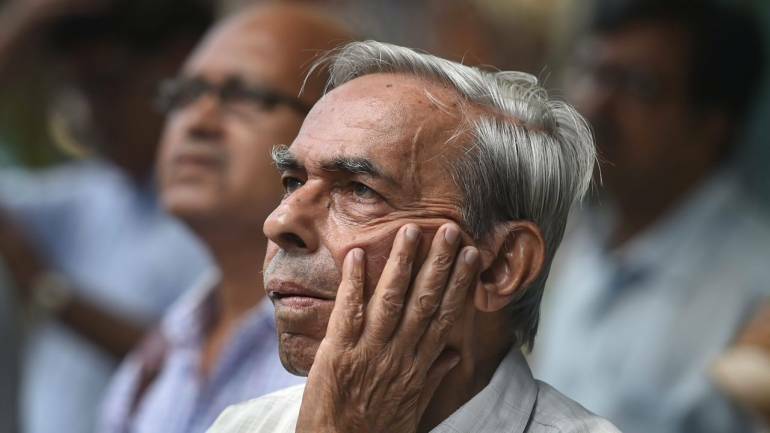 Experts said the sharp fall in the last few sessions indicated that there could be a relief rally in the coming week, but if it corrects further it could break the psychological 10,000 level as well. After opening lower at 10,514.10, the Nifty 50 gradually extended losses as the day progressed to fall below 10,300 and hit an intraday low of 10,261.90 in late trade. The index closed 282.80 points down at 10,316.50. “In line with projections Nifty50 continued its southward journey as it registered a large bearish candle before signing off the session. Even on weekly charts, it’s a fifth consecutive Bear candle suggesting the market may be stretching more on the downside, hence can attract some relief rally going forward,” Mazhar Mohammad, Chief Strategist – Technical Research and Trading Advisory, Chartviewindia.in told Moneycontrol. He added, to logically conclude its corrective structure, the Nifty 50 should move below 9,950 levels. “In between 10,300 is a decent support from where it recoiled in Friday’s session after hitting an intraday low of 10,261 levels. If this level is breached then the next target on downside shall be towards 9,950 below which there will bright chance of one corrective structure getting culminated,” he explained. India VIX moved up by 4.32 percent to 19.73 levels. Volatility is not cooling down which is not giving the relief to bulls and suggests a tight bear grip in the market, experts said. According to Pivot charts, the key support level is placed at 10,205.37, followed by 10,094.23. If the index starts moving upwards, key resistance levels to watch out are 10,484.17 and 10,651.83. The Nifty Bank index closed at 24,443.45, down 375.85 points on Friday. The important Pivot level, which will act as crucial support for the index, is placed at 24,102.66, followed by 23,761.93. On the upside, key resistance levels are placed at 24,932.16, followed by 25,420.93. Maximum Call open interest (OI) of 28.68 lakh contracts was seen at the 10,800 strike price. This will act as a crucial resistance level for the October series. This was followed by the 10,900 strike price, which now holds 22.85 lakh contracts in open interest, and 10,700, which has accumulated 22.75 lakh contracts in open interest. Call writing was seen at 10,500 strike, which added 16.79 lakh contracts, followed by 10,800 which added 14.51 lakh contracts and 10,700 which added 11.28 lakh contracts. There was hardly any Call unwinding seen. Maximum Put open interest of 36.09 lakh contracts was seen at the 10,500 strike price. This will act as a crucial support level for the October series. This was followed by the 10,700 strike price, which now holds 31.57 lakh contracts in open interest, and the 10,000 strike price, which has now accumulated 24.78 lakh contracts in open interest. Put writing was seen at the strike price of 9,900, which added 4.8 lakh contracts in open interest, followed by 10,200 which added 4.51 lakh contracts and 10,100 strike which added 3.36 lakh contracts. Put unwinding was seen at the strike price of 10,500, which shed 8.35 lakh contracts in open interest, followed by 10,700 which shed 6.84 lakh contracts and 10,900 which shed 3.31 lakh contracts. Foreign institutional investors (FIIs) sold shares worth Rs 3,370.14 crore while domestic institutional investors bought shares worth Rs 1,902.07 crore in the Indian equity market on Friday, as per provisional data available on the NSE. Astron Paper and Board: Pallas Fincap bought 2,75,000 shares of the company at Rs 118.38 per share on the BSE. Indiabulls Housing Finance: Board to consider July-September quarter results & interim dividend on October 15. ICICI Securities: Board to consider July-September quarter results & interim dividend on October 19. V-Guard Industries: Board to consider July-September quarter results on October 25. Tejas Networks: Board to consider July-September quarter results on October 23. MT Educare: Board to consider July-September quarter results on October 15. Zee Learn: Board to consider July-September quarter results on October 15. Carborundum Universal: Board to consider July-September quarter results on October 29. Monnet Ispat & Energy: Board to consider July-September quarter results on October 15. Magma Fincorp: Board to consider July-September quarter results on November 2. Shriram Transport Finance Company: Company’s officials will be meeting Wellington Management on October 11. Persistent Systems: Company will be holding an investor and analyst call on October 22 after July-September quarter earnings. KP Energy: Brokers / Analysts meeting is scheduled on October 10. Indian Energy Exchange: Company’s officials will be meeting analysts/investors on October 8, 9, 10 and 11. Navin Fluorine International: Board to consider July-September quarter results & interim dividend on October 30. Orient Paper & Industries: Board to consider July-September quarter results on October 31. Indian Overseas Bank: Extraordinary General Meeting (EGM) of the company to be held on November 2 for issue of equity shares to Government Of India (GOI) on preferential basis. L&T Infotech: Board to consider July-September quarter results & interim dividend on October 24. Reliance Industrial Infrastructure: Board to consider July-September quarter results on October 15. NOCIL: Board to consider July-September quarter results on October 30. Everest Industries: Board to consider July-September quarter results on October 24. DCB Bank: Board to consider July-September quarter results on October 17. Alkali Metals: Board to consider July-September quarter results on October 15. Music Broadcast: Company’s officials is participating in the non-deal roadshow organised by Motilal Oswal Securities on October 8 and 9. Shriram City Union Finance: Company’s officials will be meeting Matthews India Fund on October 8. Zenlabs Ethica: Board meeting is scheduled on October 15 to consider and approve allotment of bonus equity shares in ratio of one equity share of Rs 10 each for every 20 existing equity share of Rs 10 each. Cochin Shipyard: Board meeting to consider the proposal for buy back of the fully paid-up equity shares of the company has been rescheduled to October 17. Arvind: Kulin Lalbhai – Executive Director of Arvind and Suresh J – MD and CEO of Arvind Lifestyle Brands are attending a few investor meetings on October 11 and 12. PPAP Automotive: Board to consider July-September quarter results & interim dividend on October 23. Yes Bank: Company has appointed two former chairmen — TS Vijayan of LIC and OP Bhatt of SBI to its search and selection committee to find a successor for Rana Kapoor. Indiabulls Housing Finance: Company has redeemed (bought back) secured, redeemable, non-convertible debentures of face value Rs 10,00,000 each. Additionally, the company has bought back Rs 1,505 crore of commercial paper since September 21, 2018 till date. ICICI Prudential Life Insurance and ICICI Lombard General Insurance: Chanda Kochhar and Sandeep Bakhshi tendered their resignation as the directors of the company. ICICI Securities: Chanda Kochhar and Vishakha Mulye resigned from the board of directors of the company. NBCC India: Company has secured the total business of Rs 353.70 crore in September. Himachal Futuristic Communications: Company has received an advance purchase order worth Rs 879 crore approximately from Telecommunications Consultants India Limited (TCIL) New Delhi. Escorts: ICRA reaffirmed and assigned the long-term rating to AA- and short-term rating to A1+ in respect of bank facilities for Rs 866 crore & Rs 150 crore for commercial papers of the company. Great Eastern Shipping: CARE revised its rating on company’s non-convertible debentures of Rs 3,450 crore to AA+/Stable from AAA/Negative. Infinite Computer Solutions: Company’s acquirers, namely MC Data Systems Private Limited and Inswell IT Applications Private Limited dispatched the Letter of Offer for delisting offer. UltraTech Cement: Supreme Court has admitted the company”s appeal and has granted stay against the orders of the CCI / NCLAT. Avenue Supermarts: Board of Directors at their meeting scheduled to be held on October 13 shall consider raising of funds by issuance of commercial paper. Gopala Polyplast: Board of directors of the company allotted 1,50,000 equity shares of Rs 10 each at a premium of Rs 50 per share to non-promoters of the company on preferential basis upon conversion of 1,50,000 warrants of Rs 10 each. Autoline Industries: Board of directors of the company approved raising of funds of Rs 73 crore by way of issue of upto 60,27,397 share warrants of Rs 10 each to IndiaNivesh Renaissance Fund and Promoters at a price of Rs 73 each. Mercator: CARE revised the company’s rating for long-term bank facilities to D from BBB/Negative and short-term bank facilities to A4 from A3. Gulf Oil Lubricants: ICRA reaffirmed its long-term rating of AA and the short-term rating of A1+ outstanding on the bank limits of the company aggregating to Rs 492 crore (enhanced from Rs 392 crore). The outlook on the long-term rating has been revised from ‘Stable’ to ‘Positive’. Texmaco Rail & Engineering: Company and Russian firm RZD International during Annual India-Russia Bilateral Summit signed a memorandum of understanding for working in collaboration for mutually identified various domestic and international projects in the sphere of railways and infrastructure. Peninsula Land: ICRA revised its rating on company’s non-convertible debentures of Rs 648.93 crore to A- from BBB+. SPML Infra: Subsidiary Bhilwara Jaipur Toll Road Private Limited, wherein company holds 51 percent stake with an investment value of Rs 52.85 crore has served a notice of termination of the concessation agreement with Rajasthan government. OM Metals Infraprojects: Its JV, Bhilwara Jaipur Toll Road Private Limited, where the company has a stake of 49 percent with Rs 50.90 crore investment in equity and Rs 65 crore in subordinate debt has served a notice of termination of the concession agreement with Rajasthan government. Piramal Enterprises: Board approved the allotment of 3,22,240 equity shares or face value of Rs 2 each at a conversion premium of Rs 2,688 per share pursuant to optional conversion of 8.056 CCDs of face value of Rs 1.07,600 each aggregating to Rs 86,68.25,600. DCB Bank: Bank announced revised marginal cost of funds based lending rate. Sunteck Realty: Company issued Commercial Paper of Rs 35 crore. Sobha: Company during July-September quarter achieved new sales volume of 1,031,602 square feet total valued at Rs 740.8 crore with an average realisation of Rs 7,181 per square feet (Sobha share of sales value at Rs 616.6 crore with an average realisation of Rs 5,977 per square feet). Sales volume is up by 7 percent as compared to preceding quarter & up by 19 percent YoY. Sales volume achieved during the second quarter is the highest in the past 5 years. Thomas Cook India Group: Company enters the travel tech space, announces strategic investment to acquire 24 percent stake in Ithaka. JSW Energy: CARE revised the company’s ratings on the long term Bank facilities and non-convertible debentures from ‘AA-/Negative’ to ‘AA-/Stable’. The company’s ratings on short term Bank facilities and commercial paper issue are reaffirmed at ‘A1+’. CMI: CARE reaffirmed the rating BBB+ assigned to the long term bank facilities and A3+ assigned to the short term bank facilities availed by the company. Infosys: EdgeVerve launches AssistEdge Community Edition – a free-to-use automation platform for students and independent developers. Inox Leisure: Company commenced the commercial operations of two additional screens (with seating capacity of 94 seats) in the existing multiplex cinema theatre, taken on leave and license basis, and located at METRO INOX Cinemas, Mumbai. With addition of two more screens, the said Multiplex Cinema Theatre has 8 screens and 1365 seats. PNB Housing Finance: Company has raised Rs 1,470 crore via external commercial borrowing under automatic route. Gati: CARE downgraded its rating for company’s long term bank facilities of Rs 173 crore to BBB/Stable from A-/Stable. MEP Infrastructure Developers: Subsidiary MEP SANJOSE Talaja Mahuva Road Private Limited has achieved the Milestone One for the project of four laning of Talaja- Mahuva Section of NH-8E in Gujarat on Hybrid Annuity mode under NHDP Phase IV. The Authority has paid the first Milestone payment of 20 percent of the physical progress for the project. PAE: Company accepted one time settlement (OTS) scheme of the State Bank of India. Securities in ban period for the next day’s trade under the F&O segment include companies in which the security has crossed 95 percent of the market-wide position limit. For October 6, not a single stock is present in this list. Are transportation stocks the market’s canary in a coal mine?